Lake Louise - Blog from Lake Louise, Alberta | Dreaming of a White Christmas! We met some Aussies in Alaska who told us to be sure to visit Moraine Lake when we were at Lake Louise as it was even more spectacular. They also said to go early because it gets very crowded. We drove there this morning arriving about 8.45am. It was a cool morning but much colder up the mountain. The car shows the outside temperature and it was -4. It certainly felt like it when we got out. There were' many people about and the lake was very still. It was frozen around the shallow edges. When we through stones on it, it sounded like glass shattering. It was more spectacular than Lake Louise because of the mountains surrounding it. There are 10 peaks. The colour of the lake was subdued as the sun hadn't hit it as yet. At the beginning of the lake was a massive pile of rocks from a previous glacier. This is called a moraine. We walked around a bit but it was very cold so we didn't stay out too long. Last night at dinner, we had ordered a cocktail called a Emerald Icefall. Our waiter told us he had invented the drink and it was the colour of Emerald Lake. We asked him where that was and he said it was only about 30mins away. We decided we would go there today and asked the concierge for directions last night. It turns out a Emerald Lake is in Yoho National Park and the concierge gave us a sheet with some points of interest on it. We turned the Gypsy Guide on only to find he was taking us to all the same places. Yoho National Park is in British Columbia which we crossed into after about 20mins. Our first stop was the Spiral Tunnels. These are 2 tunnels built into the very steep Kicking Horse Pass to allow trains to negotiate the mountain more easily. Gypsy told us trains pass through every 15-20mins. We waited 30mins but didn't see one. It was too cold to stay out of the car in the shade but we did see a train going through one of the tunnels later in the day. The outside temperature was still 0 at 11.30am. A chilly day!! Our second stop was Emerald Lake. It is the biggest lake in Yoho and named because of it's beautiful emerald green colour caused by the glacial silt in the water. There were plenty of people hiring canoes and paddling around the lake. The lake is bordered on one side by Mount Burgess which is made up of Burgess Shale. Fossils were found in the shale which was a very important historical find. The area is protected now and can only be accessed on a guided hike. Our next stop was Natural Bridge. This used to be a waterfall but years of water washing over it had worn away some of the rock and the water now passes under the rock instead of over it. Our last stop in Yoho was Takkakaw Falls. These are the third highest falls in Canada with a drop of over 254m. The noise and force of the water was quite incredible. It was getting on to 2pm by the time we finished our tour of Yoho National Park so we headed back to Lake Louise and up to the gondola. It is advertised as the best grizzly bear viewing in Lake Louise so we had high expectations but didn't see any sign of bears. You have the choice of a gondola or an open chair. We chose the chair as it was now 11degrees and sunny with a clear blue sky. It was a long rude up to the top. Once at the to we walked to the viewing platform where there were chairs around in different spots. We sat in the dun admiring the view for some time. As far as you could see from left to right there were mountains punctuated by the green of Lake Louise. It was absolutely beautiful. We came back down on an open chair and spotted a deer but still no bears. On the way back to The Fairmont, we decided to go to Moraine Lake again to see if it was different in the afternoon sun. We didn't know if it would still have dun on it as it was 4.30pm. It was greener than when we saw it in the morning. 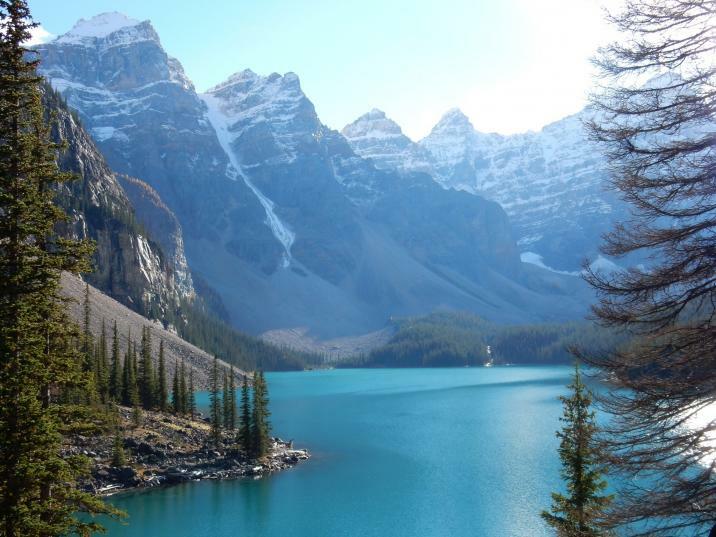 The attached pho is Moraine Lake in the afternoon. There were lots of people down there and some had climbed the massive rock pile or moraine. We looked it it but you had to cross a pile of wobbly logs sitting in water to get to it. Not for me. We saw a little wooden bridge and found a trail which led around the back of the moraine and there were steps which took us to the top. We got a slightly better view up there but couldn't see all 10 peaks. It was beautiful though. Tomorrow we are heading for Jasper via the Icefields Parkway. I am looking forward to that!